Validation and Verification: traditionalists know these ideas well. Do they still have relevance in the Agile space? Validation: the requirements ‘deck’ is validated for completeness and accuracy. If there are priorities expressed within the deck, these priorities are also validated since priorities affect resource utilization, sequencing, and schedule. Verification: After integration testing, the deck is verified to ensure that every validated requirement was developed and integrated into the deliverable baseline; or that changed/deleted requirements were handled as intended. Agile: what's to verify; what's to validate? The BIG QUESTION: Is the strategic intent of the narrative answered? Is the business case on a path to success? After all, the grand bargain in Agile is that flexibility for tactical implementation is allowed insofar as there is faithfulness to the strategic intent. Tactics are fluid; strategy is not. Certainly, Agile projects are less amenable to the conventional V-and-V processes because of the dynamic and less stationary nature of requirements. Validation: After the business case is set, the top-level narrative is in place, and the overall strategy of the project is framed, some structured analysis can occur on the top level requirements. Conversational-style requirements -- aka, stories -- are also validated, typically after the project backlog or iteration backlog is updated. Verification: After integration testing, the deliverable functionality is verified to ensure that every validated conversation was developed and integrated into the deliverable baseline; or that changed/deleted conversations were handled as intended. During development, expect some consolidation of stories, and expect some use (or reuse) of common functionality. Thus, recognize that Agile may not maintain a fully traceable identify from the time a conversation is moved into the design and development queue to the time integration testing is completed. However, the spirit of the conversation should be there is some form. It’s to those conversational forms that verification is directed. The last thing to do is circle back to the narrative: Is the big question verified? If so: victory! Have you ever been asked: "What time is the 3 pm meeting?" You're thinking: "This guy is on something; or he's texting while talking!" We here in the backyard of the seemingly larger-than-life Walt Disney World* pay some attention to the management paradigms coming out of our corporate neighbor. “What time is the 3 o’clock parade?” On any given day in the Magic Kingdom at Walt Disney World Resort, you might hear Guests asking our Cast Members this seemingly peculiar question. And, while the question appears to have an obvious answer, we also know that frequently the true question lies beyond the obvious. Instead of simply repeating the obvious answer—the actual parade start time—back to the Guest, our Cast Members take this opportunity to .... share with the Guest what time the parade will pass by certain locations in the park, offer possible vantage points to view the parade or advise when to leave another area and still arrive at the parade on time. .... the “3 o’clock parade” question is commonly used to help Cast Members understand that their answer can either end the conversation, or it can begin a quest for richer discovery. Looking for project dashboard that really provides insight at a glance? Take notice of the neat arrangement of program success divided left and right by internal and external factors. This presentation is intended as a dashboard. The colors are dynamic on a Red-Green-Yellow-Gray (not evaluated) scale. 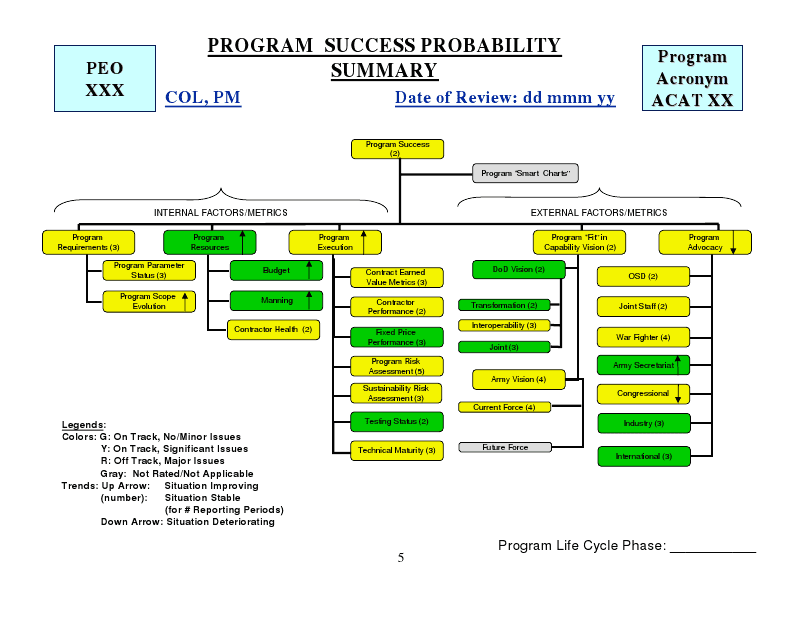 The scale has to be defined (calibrated) for each program in order for management to be able to get a proper take-away. Trends are shown in each block with arrows. Again, trends must be defined for each program, i.e. what is the meaning for an up-pointing arrow? Bottom line: an interesting suggestion for dashboards are in this presentation, along with at least one gov'y's idea of what's important. (*) Search this site for other Higbee presentations; you'll find others you might be interested in. GAITHERSBURG, Md.—The U.S. Department of Commerce’s National Institute of Standards and Technology (NIST) has signed a cooperative research and development agreement (CRADA) with SRI International to lead a consortium focused on quantum science and engineering. SRI International is a nonprofit, independent R&D center headquartered in Menlo Park, California. Jump on it? Criticize it? What if the same person comes in with a bad idea? Now what? (*) 2018 season opening episode of "Blue Bloods"
"The New York Herald pointed out [that] the telegraph appeared to make it possible for the whole nation to have the same idea at the same moment. .... Henry David Thoreau raised an eyebrow: "We are in great haste to construct a magnetic telegraph from Maine to Texas; but Maine and Texas, it may be, have nothing important to communicate"
Nothing important to communicate? Then why is everyone staring at their screens all the time? Could it be simple addiction to having the same idea at the same moment as everyone else? "Scholars ... have situated resilience, the ability to sustain ambition in the face of frustration, at the heart of ... leadership growth. Why some people are able to extract wisdom from experience, others not, remains a critical question"
In another venue, we might say some people are naturally street smart, while others have seen it all -- but can't make anything of it. Ooops, did the eminence of astrophysics forget project managers? Physicists may indeed move the energy ... who can forget "the bomb"? 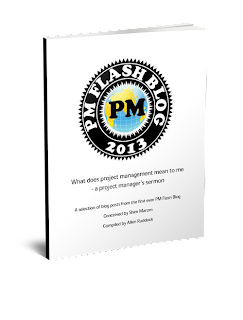 But without the PMO there would be no money, no resources, no milestones to align the dots, and thus: no project! 'Is your tail heavy' is the question raised at 'critical uncertainties' in a recent post. It might be if you are a risk with some "memory" of the immediate past. Risk with memory? What does that mean? Testing for an unlikely outcome may be easier and more economical than you might think: run a few tests; if it doesn't fail soon (infant mortality) it likely won't for a long while. Who knew heavy tails were the cheap way out of expensive testing?? !